The word “dependence” has devolved to hold a negative connotation in America. Adding to this notion is that our great nation was built on a foundational Declaration of Independence. Americans value the rugged individualism of the pioneer, innovator, self-made person, like no other culture in human history. There is a beauty and efficiency to this narrative that challenges us to break new ground and sacrificially commit to our personal dreams and destinies. Heroes are especially aggrandized when they have solely accomplished what no one else has. We elevate and celebrate individual achievement as pinnacle values of significance. The veneration of individual achievement brings with it a subtle, but powerful insinuation that if cooperation is utilized in any way, shape or form, the extra “help” exponentially diminishes the merit of the achievement. This myth of self-sufficiency is one of the most damaging contributors to not only personal development but also fulfillment and success of the Church’s mission. This week Bobby Gruenewald, on behalf of YouVersion, and I, on behalf of OneHope, were presented the Award of Excellence by the Forum of Bible Agencies – North America for the co-creation of the Bible App for Kids. The Award of Excellence is given to “an individual or organization who has made a significant contribution to the cause of Bible translation, distribution or engagement”. It is the second point that makes me most proud. That our OneHope and YouVersion teams have unselfishly worked together for three years to do something together that neither of us could have ever done on our own. 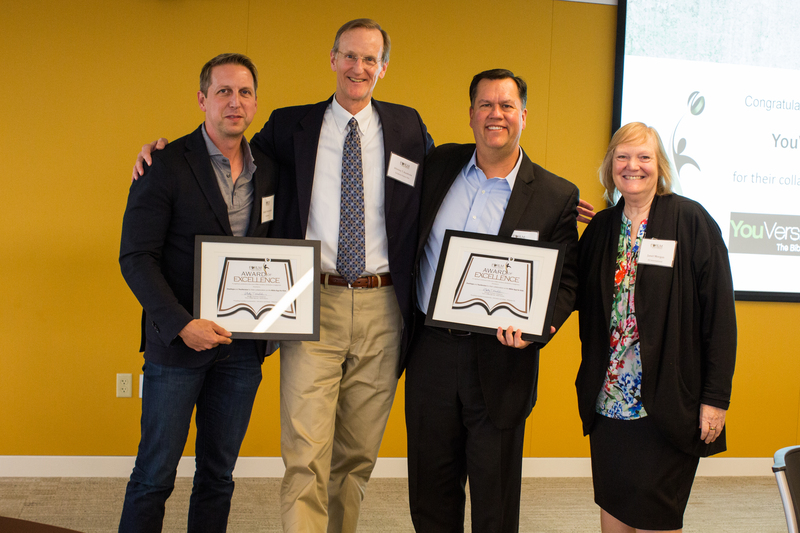 Whitney Kuniholm of Scripture Union USA and Jante Morgan presents Bobby Gruenewald of YouVersion and Rob Hoskins of OneHope with an Award of Excellence at the American Bible Society in Philadelphia. This is a tangible expression of Jesus’ priestly prayer in John 17 as he approaches the end of his earthly ministry. He is continually repeating one central theme: unity. Interdependence, not independence, is key to Kingdom expansion. In Luke 10:2 Jesus couldn’t be clearer, ‘the harvest is ripe, but the laborers are few’. Return on labor is one of the most critical components to effectively carrying out the Bible’s missional mandate. To refuse to work together is sin; it’s squandering God’s most precious resources. In most cases, failure to collaborate happens when we fall prey to the tyranny of independence and the desire to be the sole achiever. The Bible App for Kids and most other “accomplishments” attributed to our ministry have not come through greatness on our own. Instead, they are a beautiful measure of our dependence on others. At OneHope we have two main prayers: for pure hearts and motives, and for God to send us laborers. I believe any achievement is a direct result of praying, breathing and living this as a ministry for almost 30 years. The more we love, the more humbly we work, and the more diligent we become at collaboration the more freely God will bless our labors.